Tuesday 25th of November 2014 was White Ribbon Day, a day with an aim to end violence against women, and a day for those affected by violence to openly share their stories. So why did it take me a whole week to write this post? I recently wrote a short story called ‘Two Fading Fish’, a piece about a successful female manager working for the government. Everything on the surface looks fine, but the story slowly reveals her other life – her life at home – that is completely controlled by an emotionally abusive husband. Her two young daughters are suffering but she is unable to find a way out. And no one at work around her suspects a thing. With this piece I wanted to show that things are not always what they seem when it comes to domestic violence. Although not a true story, I based it on things I have seen and stories I’ve heard. I set the story in my own workplace, with characters based on those around me. It took a lot of emotion to write this piece and when I wrote it I felt very strongly about what needed to be said. Would people think it’s a story about me and my husband? Would anyone believe me if I told them the truth? Should I even tell people about it? It seemed strange to worry about these things. I didn’t hesitate to promote my ‘trip to Mars’ story or my story about fostering dogs. I’ve published Friday Fictioneers pieces about broken hearts, love triangles and even murder… without a single concern about whether readers would connect them to my everyday life. But this domestic violence piece had me sit on it for a whole week thinking about what to do. Eventually I came to this realisation: the hesitation I feel about sharing my story would be nothing compared to the hesitation felt by women personally affected by domestic violence. Those who find the courage to speak up must be some of the bravest people on earth. So I decided to promote the book openly and unashamedly. For those who have been brave enough to speak up and for those who feel they can’t. This anthology is an incredible collection of raw and unique stories. Some of them are gruesome, most are devastating, but all are stories that need to be told. 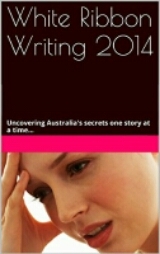 ‘White Ribbon Writing 2014: Uncovering Australia’s Secrets One Story at a Time…’ was released as an eBook on 25 November 2014 with plans to produce a hard copy in the near future. The eBook can be purchased online for $6.85. Great insight Jessie through your experience of writing and then pondering on telling others of your success. This issue needs many more bright lights like this shone upon it. Thanks Marg, it sure does! Hopefully the recognition through Rosie Batty’s Australian of the Year will shine the light even more. Congratulations Jessie, I’m looking forward to reading all the brave stories in this anthology. It’s an important topic to talk about. Well done. A (very) average lawyer's musings on the Australian legal profession. With occasional pug pictures. "Cats, Twitter, Coors Light, & Everything In Between"